Follow 16-year-old patient Maya as she visits her orthotist, Don Buethorn, CPO, at Cascade Prosthetics & Orthotics—a sneak peak at a typical appointment for a patient needing DAFOs. The clinician evaluates the patient based on a combination of information from the family and members of the clinical team and makes an assessment of the patient’s voluntary level of control and range of motion. 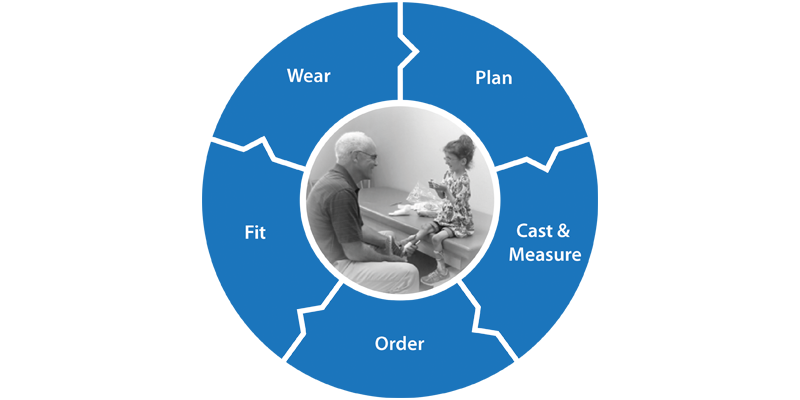 The practitioner measures by casting the patient’s foot and ankle (for custom DAFOs) or by using a plastic sizing jig (for prefabricated Fast Fit orthoses). The practitioner completes an order form indicating the style and type of brace planned for the patient. The practitioner sends the order form, along with the patient’s cast (if applicable) to Cascade Dafo, where our skilled team of technicians manufacture the brace based on the practitioner’s precise specifications. The patient returns to the practitioner’s office to have the brace(s) fit. The practitioner evaluates the braces for proper fit and function, making any necessary fitting adjustments, and provides wearing instructions for the initial break-in period. Once the patient has progresses past the initial break-in period, the practitioner further evaluates brace fit and function. Is the patient falling less, able to walk without assistance, more comfortable and confident when standing and walking? Feedback is critical to the clinical team in their evaluation of the fit and function of the brace(s). Keep in mind that the brace may be part of ongoing plan that changes as the patient grows and his/her gait changes.